Smart mobiles have changed the way of shopping, browsing social media and, in fact, every other possible website with its look. This has led to a new wave of surfing the internet. Mobile browsing used to be a mania for most of us, to search and learn every aspect through mobile where PC, laptop are available. 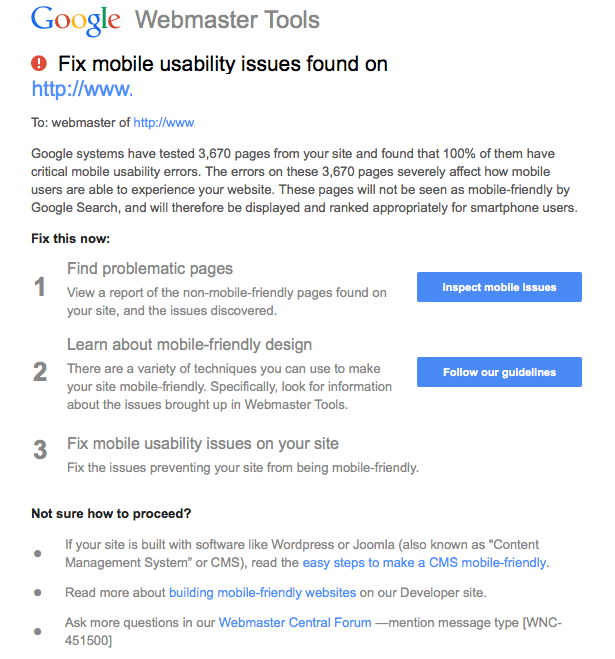 But now, this has become an emergency as Google mobile ranking algorithm is going to start its plunge and rank the web pages based on mobile-friendly aspect from this April 2015. This is not a new or a sudden alarming notice from the giant search engine which has shaken and modified the world of web pages on internet many a times with their rankings. Right from 2012, they are stressing the importance of responsive websites as mobile plays an interesting role in every business. It is before getting down the pulse of business owners all at a sudden, the Google team has taken an initiative to send the companies a clear report on the mobile usability issues. They are mentioning the number of problematic pages which might suffer from their rankings. So, this is the perfect time to focus and learn how to fix mobile usability issues on high priority. Responsive websites often help to come out of this crucial situation. This is often considered to be the best and easy way of viewing a webpage alike on all devices including mobile. All this happens as there will be a single URL and HTML for a business web page. So, every company is showing interest to design responsive web pages for better sales and not to get triggered with mobile ranking algorithm. All the companies are targeting their audience niche and connecting to them at the social media websites. Mobiles are often used these days to surf social websites at every possible second of an hour. Here the ad campaigns are lucrative and there is majority of chances for the users to click on those ads. Again the importance of a mobile friendly site comes into the picture as the mobile searches are vital to make a purchasing decision. Why someone does wants to bear the broken mobile site penalty even after getting the warnings from the Google about the mobile usability factors which are missing. So now it is the time to Fix mobile usability issues found on web pages. First, notice the web pages which are mentioned and how many of them, Google is able to trace with its magical algorithms which strive for efficiency. The call for quick action is essential if the majority of the web pages rankings is going to get affected by the mobile-friendly labels. Traffic for these pages will be lost now and this is where the SEO audits come to help. The bells have already rung for emergency, so spend quality time and invest wisely on mobile optimization as this is going to enhance your brand reputation and indeed bring intense traffic, sales for sure. We are providing this service for a very affordable price. Here, we come up with innovative solutions and optimize your website for mobiles. All those who are worried about their rankings because of Google algorithm may come to us. Our team of experts knows how to fix mobile usability issues and they easily overcome all design and functional challenges of a website conversion from desktop to mobile.